Nikola Tesla at age sixty-four. During the first half of his life, Nikola Tesla invented the AC motor, radio, remote control, and harnessed the power of Niagara Falls. Then he formed a scheme to deliver electrical power through the air. Would it work? At his Colorado laboratory, Tesla thought he had conquered the problems of sending electricity through the air. This solution allowed him to envision a whole new world with a global communication network powered by high frequency signals. Before he could bring this new world into being, however, Tesla needed cash. To attract potential investors, Tesla agreed to write a piece for Century magazine. It was entitled "The Problem of Increasing Human Energy" and was published in the magazine's June 1900 edition. In it, Tesla told of his vision for the future: the weather controlled via radio signals, war ended because it was entirely fought by robots, the tapping of the sun's energy via a giant antenna, and power transmitted through the air without wires. His system, a "world wide wireless" when "applied the earth will [allow it to] be converted into a huge brain, capable of response in every one of its parts," Tesla would later say. The article read more like fiction than science, but the photos that accompanied the article seemed even more unbelieveable.For example, one picture showed Tesla seated at a chair in his Colorado laboratory while streamers of high voltage electricity snaked all around him. Indeed, the picture seemed incredible because it had been produced with trick photography. The electrical bolts had been photographed in a darkened room with a time exposure. Later, the same film was exposed again, this time to a room with Tesla sitting quietly in a chair. When the film was developed, it gave the impression that Tesla had been sitting in the chair while the electrical storm raged around him. The photographs and text did their work and attracted the attention of one of the wealthiest men of the day, J.P Morgan. Morgan gave Tesla $100,000 to develop the "world-wide wireless" to send messages across the Atlantic. Tesla, though, had even grander schemes than he let on to Morgan. His wireless station would not only transmit signals, but power. The site chosen for his transmission station was located on the cliffs overlooking Long Island Sound at a place Testla called Wardenclyffe. Construction began in 1900. 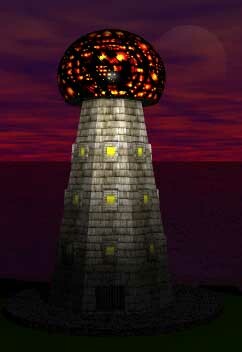 The most remarkable part of the project was a 187-foot-tall tower topped with a fifty-five-ton sphere made of steel. Beneath the tower, sixteen iron pipes were driven three hundred feet into the earth. The construction costs quickly exceeded the money provided by Morgan, however, and the financier was reluctant to give any more. Morgan was further convinced that additional financing was not warranted when on December 12, 1901, Marconi sent the letter "S" across the Atlantic from Cornwall, England, to Newfoundland by wireless. Marconi's approach was much cheaper than Tesla's and Morgan saw no reason to invest any more in Wardenclyffe. Tesla's stock among Wall Street investors was falling and he himself observed, ""My enemies have been so successful in portraying me as a poet and a visionary," he said, "that I must put out something commercial without delay." Tesla could not find any more backers and most of the site's activity had to be shut down in 1905. Newspapers referred to it as, "Tesla's million-dollar folly." The failure of Wardenclyffe lead Tesla to a nervous breakdown. Ironically, the person who lost the most in the failure of Wardenclyffe besides Tesla might have been J.P. Morgan. Tesla's design for a multi-channel, multiplex, wireless system was much superior to Marconi's design and probably would have made Morgan an additional fortune if he had only continued his investment. Did Wardenclyffe Cause the Great 1908 Siberian Explosion? In 1908 large parts of Siberia were flattened by an enormous and mysterious explosion. The evidence has led most scientists to suspect that a large asteroid or comet entered the atmosphere and exploded over that isolated region. Some people, however, have suggested that the explosion was the result of an experiment by Tesla at Wardenclyffe. The Wardenclyffe story may have its roots in an article published in 1908 in Wireless Telegraphy & Telephone. In the article Tesla says that he would soon be able to direct electrical energy "with great precision" to any point on the globe. Perhaps, proponents of this idea contend, he directed it to a point in remote Siberia? As intriguing as this story was, there was very little happening at Wardenclyffe in 1908. While parts of the building were still used until 1907, most of it was shut down, and the vital equipment had been removed several years earlier. The truth is that Tesla had no equipment to run such a dangerous test (if indeed he would have) at Wardenclyffe in 1908. Tesla went back into the lab in 1906. Several years of effort resulted in the Tesla turbine. A normal turbine of that day was basically a propellor in a housing that would spin a shaft as moving gas or liquid passed through the housing. Tesla's design was radically different, however. It was a series of closely-spaced discs attached to a shaft. Gas or steam was injected between the discs, spinning them at a high rate of speed. The design was extremely efficient and Tesla envisioned it driving airplanes and automobiles as well as ships, trains and trucks. By 1913 J.P. Morgan was dead, but Tesla was able to get a $15,000 loan from his son to further develop the turbine. This amount, however, was not enough money to let Tesla overcome the problems that had shown up in the invention. The discs in the turbine spun so fast that they quickly became deformed from heat. Tesla could never resolve this problem with the metals available in those days and the promising invention had to be shelved. Between 1905 and the beginning of World War II, friends began to notice changes in Tesla. Perhaps his disappointments with the Wardenclyffe project and the turbine were some of the reasons he seemed more depressed, withdrawn and eccentric. Visiting the local parks, he would rescue injured pigeons and take them back to his hotel room so he could nurse them back to health. At that time he also became more secretive with his actual discoveries and more likely to speculate in the press about seemingly impossible inventions and ideas. Though some of his ideas seemed impossible to build, quite a few would turn out to near perfect predictions of future inventions. As far back as 1900, Tesla had talked about the concept of using radio waves to detect objects at a distance. "For instance, " he wrote in an article for the magazine Century, "by their [standing electromagnetic waves] use we may produce at will , from a sending station, an electrical effect in any particular region of the globe; [with which] we may determine the relative position or course of a moving object, such as a vessel at sea, the distance traversed by the same, or its speed." In the August 1917 issue of The Electrical Experimenter, he went on to outline the principals of modern military radar in detail. Tesla thought it could be used to find submarines (which turned out to be impractical because of the great attenuation of electrical waves as they pass though water) but a similar design would be applied successfully to find aircraft and surface ships during W.W.II. Iin 1934 when Dr. Emil Girardeau lead an effort to build and install the first French radar systems, he credited Tesla, saying the equipment was "precisely apparatuses conceived according to the principles stated by Tesla." In 1922, Tesla turned 65. To some his ideas started to seem old-fashioned. By now he was making a living as a consulting engineer, but the solutions he delivered to his customers often seemed impractical. 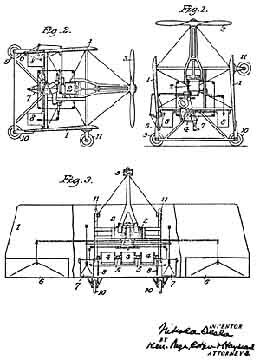 In 1928 Tesla received his last patent, number 6,555,114, for an "Apparatus For Aerial Transportation." His idea was for a VSTOL (vertical short takeoff and landing) aircraft of brilliant design, but unfortunately Tesla could never raise the money to develop it. Tesla's last major scientific proposal, made in 1934, was his famous "death beam." Tesla had a hatred for war, and he thought that if he could come up with a purely defensive weapon of great power it might be used to discourage aggression between nations. 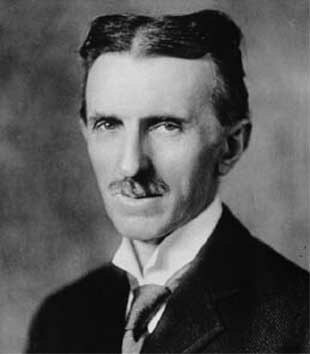 A front page article in the New York Times on July 11 of that year was entitled, "TESLA, AT 78, BARES NEW 'DEATH BEAM'" and told of the inventor's proposal that would "send concentrated beams of particles through the free air, of such tremendous energy that they will bring down a fleet of 10,000 enemy airplanes at a distance of 250 miles..."
Tesla envisioned a string of power plants along a nation's coast supplying the energy to run the beams. Since the range would be limited by the curvature of the Earth to about 200 miles, it would be effective against attacking aircraft and ships, but could not be used as an offensive weapon on other country's homelands. Plans Tesla filed to support his patent for a VSTOL aircraft. Again Tesla went to the younger Morgan for financing, but was turned down. He tried to interest the British government, but after the Prime Minister Neville Chamberlain resigned, the British lost interest. Frustrated, Tesla then sent a technical paper describing the weapon to a number of Allied nations. The paper was entitled "New Art of Projecting Concentrated Non-Dispersive Energy Through Natural Media" and described what would later be termed a charged particle beam weapon. Most engineers of the day considered such an invention impractical and no charged particle beam weapon played a role in W.W.II. However, during the cold war between the Soviet Union and the United States several decades later, both would spend considerable time and money trying to develop such a device. On January 7th, 1943, at the age of eighty-six, Tesla died in his room at the Hotel New Yorker. The controversy that often surrounded his life did not end with his death. Within a few hours of his passing, Tesla's nephew, Sava Kosanovic, a Yugoslav official, arrived at his room to find that many technical papers as well as the inventor's black notebook were missing. The FBI investigated and later the rest of Tesla's effects were impounded not to be released until 1952 when some remaining papers and possessions were sent to Belgrade, Yugoslavia, where a museum had been established in Tesla's honor. After the end of WW II, copies of Tesla's papers on particle beam weaponry used by a U.S. Airforce operation (code-named "Project Nick") also mysteriously disappeared without a trace. His thoughts and efforts during at least the past 15 years were primarily of a speculative, philosophical, and somewhat promotional character often concerned with the production and wireless transmission of power; but did not include new, sound, workable principles or methods for realizing such results. The committee could not know what was in the missing papers, however. Did Nikola Tesla invent some secret weapon that is still today cloaked from the public for reasons of national security? Or if he had designed such a weapon did he decide that this knowledge was too powerful for anyone to possess and took the information to his grave? We may never know. Tesla: A Man Out of Time by Margaret Cheney, Dell Publsihing, 1983. They All Laughed by Ira Flatow, HaperPerennial 1993. The Life and Times of Nikola Tesla by Marc J. Seifer, Citadel Press Book.